Not all slots are the same and there’s always room for something a little different in the online casino landscape; Fire Opals from IGT is one such game which dispenses with the usual reels layout and includes a couple of nice features which mark it out from the crowd. 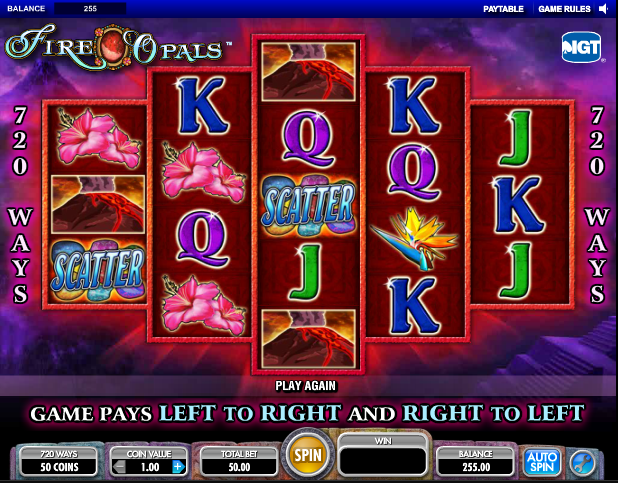 There’s a Pacific island feel to this game and this five reel, 720 payline slot is all about precious gems and volcanoes; J, Q and K are the low value symbols but we also have an insect, a flower, a volcano, and an island girl as the high values. There’s also a wild symbol, a scatter symbol and the blue and red opals are the bonus triggers. In the main game it’s the red opal symbols which will trigger the bonus game and you’ll need to land one anywhere on each reel to enter the bonus round. You’ll now get ten free spins with each win paid at the same bet level as you were playing in the standard game. Within the bonus game the reels change to feature a number of different symbols; the insect and the flower are replaced by a green gem and a ring while the opal now becomes blue. If you can land five blue opals within the bonus round you’ll get another ten spins. Multiway Xtra is IGT’s proprietary mechanism to shake up the way paylines work; you can’t choose how many lines you play but you can win from right to left as well left to right and you can also win as long as the symbols are in adjacent columns, not just in set paylines. Whether it enables you to win any more is another question but it’s an interesting feature. 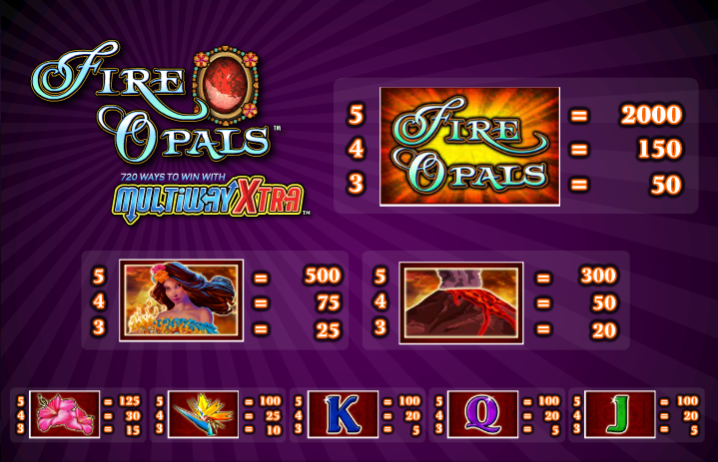 Although Fire Opals is fairly similar to some of IGT’s other slots it’s still different enough to make it worth playing. If you can get a good bonus run going it’s also extremely profitable.